Vision-impaired Catholics have been listening to the smooth voice of Villa Maria Catholic Homes volunteer John Doherty for 19 years. Source: Melbourne Catholic. Each week from his Adelaide home, John records text from Catholic magazines, Sunday Mass readings and newsletters for vision impaired people supported by Villa Maria Catholic Homes. Now, the process will become much easier with the introduction of Envoy Connect, a simple audio book player which will replace the outdated ‘DAISY’ CD system. The user-friendly player can hold up to 30 audio books, fits into the palm of your hand, and requires no batteries. Supporting people with vision impairment is a topic close to VMCH’s heart. Villa Maria was founded as the Catholic Braille Writers’ Association in 1907 by Louisa Fawkner, a partially blind early colonist of Melbourne who worked tirelessly to have Catholic literature transcribed into Braille. VMCH is currently working with Vision Australia to distribute the Envoy Connect system to the people supported by the service sometime in the next few months. 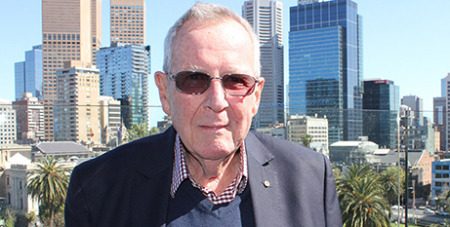 Mr Doherty – who worked as a television newsreader in Adelaide – said he was privileged to see the recording program move with the times; first from cassettes, then CDs, and now an audio player. “We’ve got to continue to explore easy methods of distribution and campaign to attract more people to use this service,” Mr Doherty said.